After weeks of engorging on calorie-laden holiday food, I’m always craving a return to something lighter and healthier. As I’ve said before, I believe life is about indulging periodically and balancing the indulgences with healthy eating. I find that soups are a great way to come back to that balance. Soup also warms the soul on a cold, wintery night. I grabbed some fresh tortelloni at my farmer’s market last week, knowing that I’d be wanting something warm and healthy after the holidays. I usually buy tortellini, and I’ve always assumed that it was the smaller version of tortelloni. However, when I checked there is a more significant difference. Tortellini, as it turns out, is typically stuffed with a hearty meat filling while tortelloni usually contains cheese and vegetables. The ones I bought were stuffed with a mild cheese. 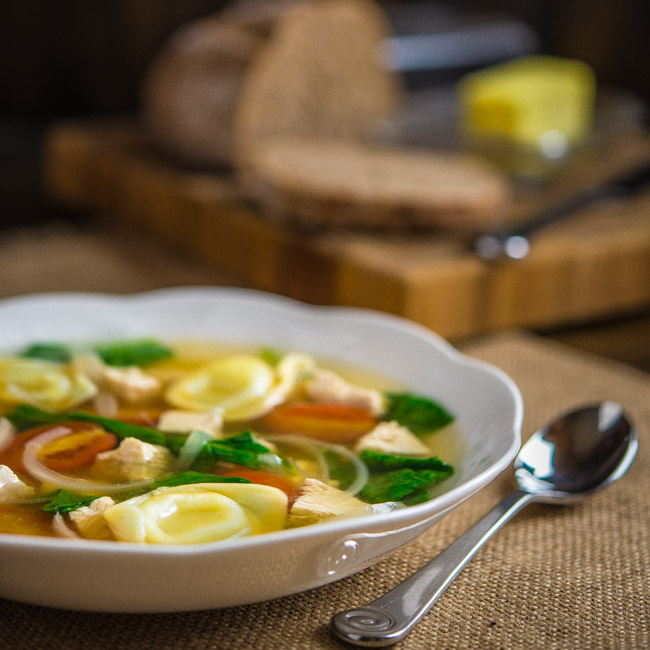 This simple, chicken broth-based soup offers a delicious way to get back into a balance of healthy eating. Serve this soup with some buttered, crusty bread and you’ve got a great dinner to ring in the new year. 1. Bring chicken stock to a boil in a large soup pot. Add chicken breasts, thyme, bay leaves, salt and pepper. Reduce heat, cover, and simmer for 15 to 20 minutes. Remove chicken and set aside to cool. When cooled, remove meat from the bones and cut into bite-sized pieces. 2. Add onion to chicken stock and simmer for 5 to 8 minutes. Add tortelloni and tomatoes and simmer for 3 to 4 minutes. Add chicken and spinach and simmer for 4 to 5 minutes. Adjust salt and pepper to taste. Serve immediately. Love this, Bill — perfect after all the excesses of the holidays! I love soups of any kind and this is exactly what I need after several days of holiday indulgence. I can’t wait to try it!